My dad unexpectedly had an emergency family matter to attend in Fuzhou, China this past Wednesday and will not be back until mid-April. What this means is I have the entire kitchen to myself! With the cookbook I received as presents and bought as a treat of my own and with the excess time in the less busier time of the work year this means I’ll be doing the primary ingredient shopping, prepping, cooking and experimenting during the winter months. A cookbook I came across after having the restaurant name Frankies 457 buried in the back of my mind when a friend of mine had rave reviews is The Frankies Spuntino Kitchen Companion & Cooking Manual. It is very unlikely I ever purchase a cookbook of a particular restaurant and especially before even dining at the restaurant. The Frankies Spuntino Kitchen Companion & Cooking Manual however, is a beautiful addition to any kitchen library. With only 200 plus pages with gold trimming on the edges of the pages and amazing detailed pencil renderings of the recipes and tutorials, it has the essence of Cook’s Illustrated publications to an ancient Medieval book of wizardry. The Frankies Spuntino Kitchen Companion & Cooking Manual introduces to the cosmopolitan diners the traditional Italian cuisines presented in a contemporary setting for the modern palate. What I love most in the cookbook is the unexpected and out of ordinary instructions from how to grow your very own avocado tree beginning with the avocado pit. – is this possible in New York City? I guess I will have to try to see and of course I look forward to trying many of the recipes in the coming months. There are also non-culinary tips that may come suitable is the use of olive oil other than the use for cooking, olive oil can be used for hair and cuticle treatment. Though, Frankies 457 olive oil is too good to be pampered for the scalp when it is meant to be savored dipped in no other than excellent rustic artisanal bread from Grandaisy Bakery. For our annual year end holiday gathering my friends and I celebrated the Winter Solstice at Frankies 457. As Jeffrey Steingarten in The Man Who Ate Everything said you can tell it is an exceptional restaurant based on the quality of bread. I live by those words and it is very often true and although Grandiasy Bakery distributes to Frankies 457, it is a fine choice. The Frankies is all about knowing the purveyors and that is perhaps the secret to their success providing only the finest ingredients. The olive oil used at Frankies 457 is imported from Italy from a family owned olive orchard in Sicily under the Frankies 457 label and it is outstanding. It is absolutely addicting and it is guaranteed everyone will be wanting more across the communal table. Other recommended dishes is the Cremini Mushroom & Truffle Oil crostini ($3) and their signature dish Pork Braciola Marinara ($14). 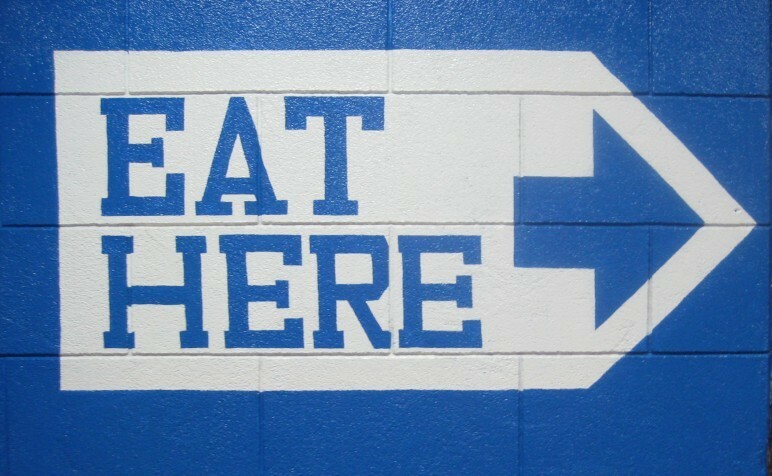 #10 Frankies 457 /// sums up my food excursions for the year 2010 as one of my top 10 most memorable eats. 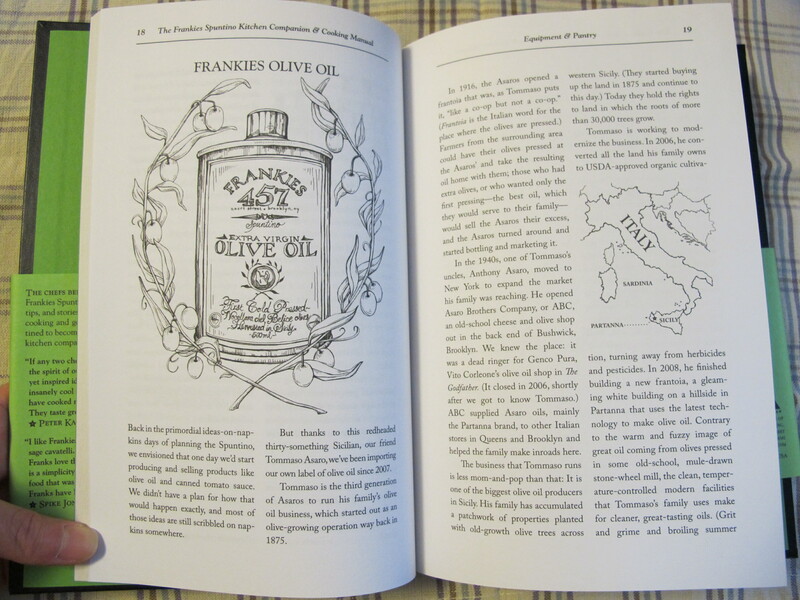 I can chug a whole canister of Frankies 457 Olive Oil! #9 The Frying Pan ///It’s a favorite Chelsea art scene hangout. The restaurant is on a tugboat on the dock of Pier 66. The garlic fries are delicious with bulbs of actual garlic cloves as seasoning and the fries are fried to a nice degree of crispness. It’s so good, it’s ashamed the vampires are missing out. #8 The Kati Roll /// Thanks to my friend Anita resourceful knowledge in Indian cuisine after her trip to India. This little joint with two locations in Manhattan, Midtown and West Village is our go to spot after an intense steamy hot yoga workout at Yoga to the People. The menu is ingenious as it is non-english literate friendly user. The menu is in pictorial images similar to the images you see when learning the alphabet. Other than the menu the Kati Roll which is an Indian liked burrito. It is a popular street food in India, a paratha Indian flat bread wrapped with meats, potatoes, paneer or egg. Good for a quick dine in or on the go bite in their nice heat retaining brown paper bag. #7 Salt & Battery /// Next to Tea & Sympathy, this fish and chips shop brings justice to little Great Britain in the Greenwich Village. A key destination in reminiscent of London. #6 Zaytoons /// Everything on the menu is worth salivating over and a trip to any of the 3 Brooklyn outpost. The variety of Middle Eastern dishes offered is fun for a large group to dine to sample dishes that goes around and what makes Zaytoon even better is it is budget friendly. #5 Tehuitzingo Deli Grocery /// You cannot get more hole in the wall than this Mexican taco paradise in Hell’s Kitchen. Hidden in the back of a Mexican bodega store. The tacos are greasily dripping deliciously good but the kitschy ambiance with a jukebox that plays American hit songs like “Total Eclipse” & “Unchained Melody” in Espanol is the real treat. #4 Ippudo /// Best lunch on one of the hottest days this summer a bowl of hot ramen with no one better than to share with my 100% pure blood Japanese friend Hiroko Shono, who just text me gave birth to a baby boy! Welcome Hunter Takumi Cheng on a blizzard day! #3 Golden Dragon Boat Cafe & Bakery /// After watching Samantha Brown Hong Kong/ Macau episode with her visit to renowned Magaret Cafe e Nata Egg Tart cafe in Macau, I was craving for a Portuguese egg tart. With very few bakeries left in Chinatown, New York City that specialize in egg tarts but only found as a decadent dessert during dim sum hours, Golden Dragon Boat Cafe remains one of the very few that still has the art in the tart. Tai Pan, Fay Da, Golden Unicorn and Lai Sum does not count. With various sorts of egg tart to your fancy, there is the traditional egg tart with the full yolk, or for the healthy cholesterol conscientious there is the egg white tart and rarely any bakeries has the Portuguese egg tart but found here ($1 each). The bakery is full of senior regulars as an afternoon tea parlor past time and the staff at the cafe are considerably courteous for a Chinatown bakery. #2 New Amsterdam Market /// I stumbled upon this outdoor public food market in my neighborhood in late June in what it has become a turning point in my life, literally. It was love at first bite. With over 50 plus food vendors from all over the Northeast region, the New Amsterdam Market introduces itself as a weekly Sunday market this Fall season gathering farmers, artisans, purveyors supporting local small business and educating us how great food tastes locally. I had my first authentic smørrebrød and witnessed a new generation in coffee. Favorite finds are not limited to The Bent Spoon, Shandaken Bake, Orwasher’s Bakery, Fleisher’s Grassfed Meats, Nuts + Nuts and Stone Barns. It is now closed for the winter but it will be back in action come Spring 2011! #1 Jimmy’s No. 43 & Wild Gourmet Food Nov 21st Supper /// 2010 was a year in food where the concept of Farm to Table really caught on as more than a food trend but a food habit in the food scene. Though no other than the guest chef at Jimmy’s No. 43 had improvised with the remaining of Wild Gourmet Food produce from the New Amsterdam Market, had pulled off a spectacular meal. It was the best of both culinary world. The fresh water crest and the amazing exotic wild mushrooms morsels and my very first ever sunchoke gathered by the lovely couple Les Hook and Nova Kim in Vermont from the Wild Gourmet Food. The menu and the dishes the owner Jimmy Carbone and the guest chef at Jimmy’s No. 43 composed was pure magically delicious. To this day I am still day dreaming the tossed water crest salad, mixed wild mushrooms with bacon and sunchoke and the hearty, comfort, creamy shepherd’s pie. It’s been an eventful year on many levels and at times dramatic. With the welcoming of a newcomer to the Yeung family, baby Audrey Lucia Yeung whom I have an instinct has inherited the foodie genes savoring on brioche at a tender age of 10 months. To my very own career change for the happier and more meaningful. As another year proceeds and as we wind into a new decade, simply enjoy and appreciate what surrounds us in which I remind myself to everyday. To everyone who has been a support for sharing your words of wisdom, giving me courage to pursue a career in food and to everyone who remains a loyal reader of my monthly food thoughts and to those who shared a meal with me in 2010. Holiday Cheers & Merry eating!